PC: Right-click image (Mac: click and hold) to download. 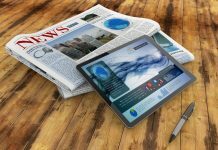 Newspapers Canada continues to research newspaper readership across different platforms and by time of day. 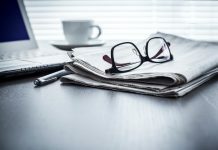 The most recent research was conducted in January 2016 and confirms the continued strength of newspaper readership across all demographics, including Business Decision Makers (BDM)*. 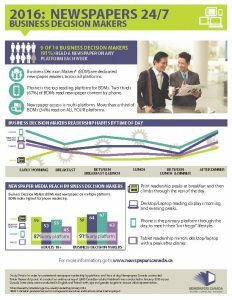 This fact sheet provides an overview of the results for Business Decision Makers (BDM)* who are dedicated newspaper readers across all platforms. 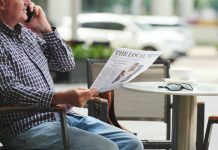 Nine in ten (91%) BDMs read newspaper content in print, on their desktop/laptop, on their phone or via their tablet, although phone is the primary newspaper access platform. This target group craves information and more than a third (34%) of BDMs read newspaper content on ALL FOUR platforms.